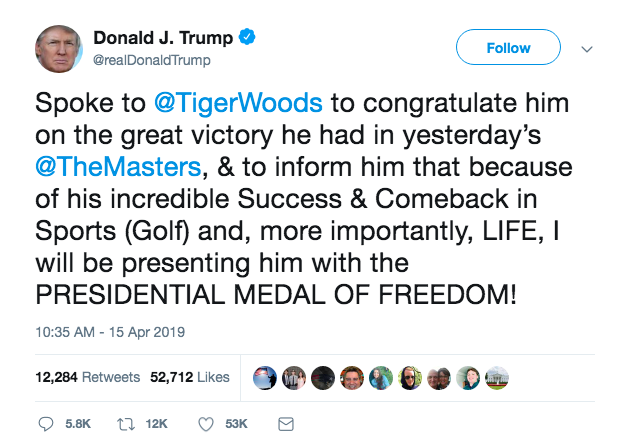 On Monday, following Tiger Woods’ victory at the 2019 Masters, President Donald Trump announced that the 15-time major champion would be awarded the Presidential Medal of Freedom. Along with the Congressional Gold Medal, the Presidential Medal of Freedom is the highest civilian award of the United States, and Woods will become the fourth golfer in history to receive the medal. President George W. Bush awarded the Presidential Medal of Freedom to both Arnold Palmer and Jack Nicklaus, while President Barack Obama bestowed the award upon Charlie Sifford in 2014. President John. F. Kennedy established the Presidential Medal of Freedom in 1963, and it is an award which on average is handed out just 11 times per year. As a Navy veteran, I’ll side with General Matts when he declares trump is an idiot. Mattis will salute Clinton, Bush, and Obama, but won’t salute Trump. He might know a little more about the current president than the hacks around here. The Presidental Medal of Freedom is a joke. For christ sake Ellen DeGeneres has one. A Presidential Medal of Freedom? Really?? I think an honorary European Tour Membership is more in line here..
What an honor for Tiger to get this from possibly the greatest president to ever hold the office! Your handle says it all! Unfortunately you and your ilk procreate at a 4 to 1 level to the more intelligent people in this country. 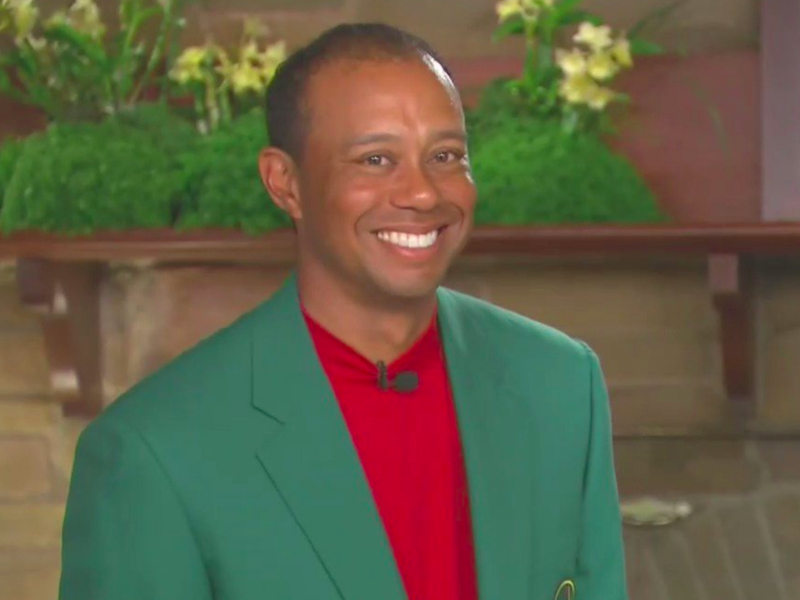 No one deserves this award more than Tiger Woods. I hope he waits a couple years and receives it from a real president and not a self-aggrandizing buffoon. It’s a shame that the President has to insert himself into Tiger’s story, and ride on Tiger’s coattails. On his own, Trump is a loser, a cheater at golf, and no one wants to have anything to do with him. Maybe by 2020 we will be done with the orange clown and he can employ a foot wedge on his own ball at his own golf course where illegal immigrants toil in violation of the law. Yes they support him because he is all about helping the rich get richer, and since most of them are millionaires they like that plan! Name the last poor person you ever worked for,,,,,,,,, I love his plan and no, I am not rich, just your average ex-illegal who became legal,served for 20+ years, made some smart investments and after 20 year in Fed. Law Enforcement, will retire next year at age 60 on about $7,500 a month. Well done sir, congratulations on your success in life. 7500 a month? That’s rich bro. Did not do it alone, great woman next to me. Discussing part is I am considered a “traitor” and sell out by several family members because I don’t “share” my good “luck”. President Eisenhower and broadcast TV help create and promote “Munis” to help the game grow. Private country clubs did nothing but perpetuate exclusiveness and status as it has done from the beginning. If there were no “Munis” the PGA and LPGA Tour would be missing many great players today!